One step closer to my ultimate goal. Five years ago, standing in a Fort Lauderdale swimming pool on the last day of vacation, I made a commitment. I would go an entire year without eating any takeout or delivered food. That commitment, so easily made watching the Florida sunset while sipping a cocktail. was just as easily broken when I returned home. In fairness, I think I made it about a month before Moo Shi chicken and pork dumplings were delivered at the end of a long and stressful day. Wherefore the failure? My entire plan hinged on learning to make the Asian favorites I couldn’t live without. While I’ve mastered light, vegetable filled Egg Foo Yung, Thai stir-fried eggplant and near-legendary dumplings, the rest of the cannon has eluded me. Until now. Last Saturday, carrying home a beautiful cold-crop of broccoli from the market, I was bound and determined to stir-fry it with beef, bright with ginger and the salty-earthy taste of soy. My first attempt, however, was an abject failure. 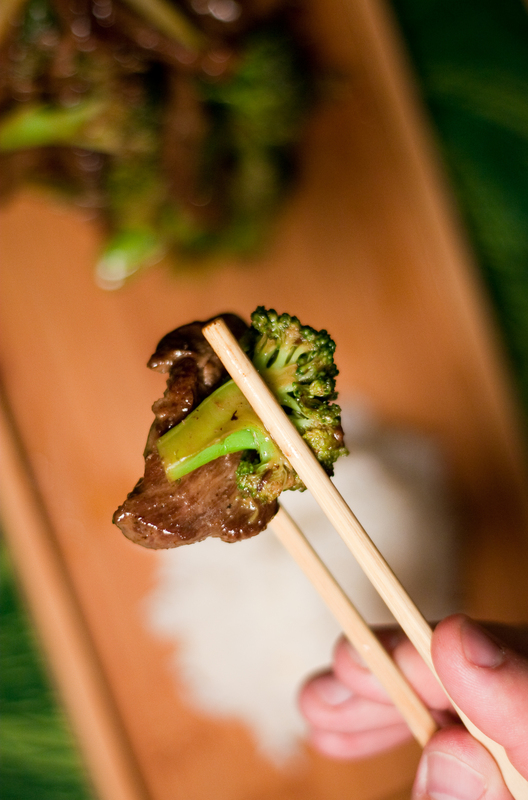 Sharp onions turned sweet, broccoli browned before turning tender, and the beef was insipid. Fixing those mistakes turned out as delicious as it was simple. Quick-steaming broccoli in rice wine (thanks for the tip Chris Brush!) produced bright-green, tender florets. Sautéing the beef in batches produced a crisp sear surrounding silky meat, and replacing onions with scallions kept the flavor sharp and green. READ THIS! No wok needed for this stove-top, skillet friendly version. There are, however, two things to keep in mind. First, prep all of your ingredients first. Secondly, there are several steps beginning with marinating the beef. The broccoli is cooked first, followed by the beef, which is cooked in three batches. 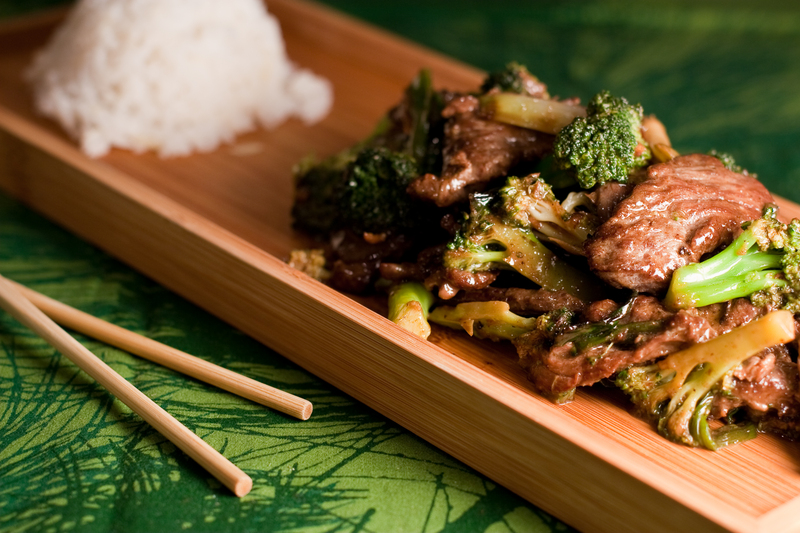 Finally, you stir-fry the scallions and return the beef and broccoli to the pan, adding the sauce at the end. It feels like a lot of steps until you do it the first time, but I promise the process is simple and the outcome delicious! *Where do you get yummy Wasabi Sesame Oil? Stop in or order online from Sapore Oil and Vinegar in Washington, DC. I drizzle it over fresh, steamed veggie and use it as a sauce for fish, chicken and beef. Cut the skirt steak into long, 2-3″ wide strips. Place in the freezer for 20 minutes. Remove steak from the freezer and slice thinly, on the bias – that’s a diagonal toward the cutting board. The goal is to increase the surface are you are searing. Whisk together the egg white, 2 tbs soy sauce, and 2 tbs rice wine in a medium bowl. Mix in steak. Add 1 tbs tapioca starch and mix in with your hands to coat. Add 1 tablespoon Wasabi Sesame Oil and toss with your hands, separating the meat. Let marinate in the fridge for 30 minutes. In a 12” skillet over medium heat, warm 1 tbs vegetable oil. Add garlic and cook, turning until browned. Remove garlic and discard. Add broccoli to pan and stir fry 1 minute, add 1/3 cup rice wine and cover. Cook until wine evaporates, about 3-5 minutes. Remove broccoli from skillet and reserve. Return pan to medium-high heat. Add 2 tbs vegetable oil. Cook beef to medium rare in 3 batches, being careful not to crowd. Add an additional tablespoon of oil between batches. Reserve beef. Whisk together sauce ingredients: 3 tbs soy sauce, 1 tbs starch, and 1/4 cup warm water. Reserve. Return pan to heat with 1 tbs vegetable oil. Add garlic and cook, turning until browned. Remove garlic and discard. Add scallions to skillet and stir-fry for 1 minute. Return broccoli to skillet with scallions and cook 1 minute longer. Return reserved beef to skillet and heat through, 1 minute. Move ingredients to the edge of the skillet, opening up the center of the pan. Heat 1 tsp oil in pan and add ginger, stir-frying for 30 seconds. Re-whisk sauce. The starch may have settled on the bottom of the bowl. Add the sauce to the middle of the pan and cook, tossing with beef and broccoli to coat. Add 2 tbs rice wine, and toss ingredients, scraping the bottom of the pan to deglaze. Drizzle the remaining 1 tbs Wasabi Sesame Oil over the dish and toss, cooking 1 minute longer to glaze the ingredients. Some of the world’s best recipes were born of necessity. Like Beef Wellington. I mean, what else do you do when there’s nothing in the fridge but puff pastry, mousse de foie gras and a a whole beef tenderloin? This dish is just like that. Deep into the sometimes challenging fall produce season, I was staring at a collection of cippolini onions, broccoli and a new Cranberry Port wine jam from Sapore Oil and Vinegar, that was just calling out for a bacon vinaigrette. A request for recommendations on my Facebook page produced a comment from ginger-haired Steve Carpinelli, and Carpinelli’s Cippolinis were born, dressed in a red cranberry port vinaigrette. 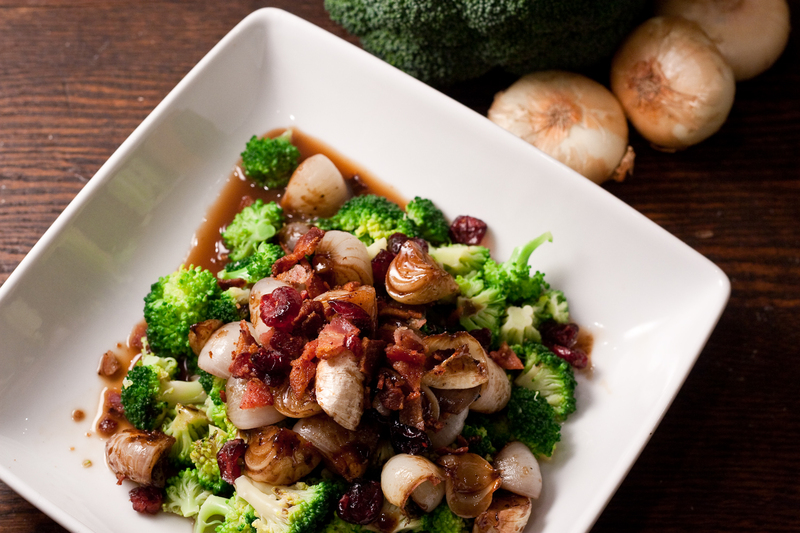 The dish balances mildly sharp cippolinis, sweet jam, and salty/fatty bacon, all grounded by earthy broccoli. It’s colorful and fun, and offers a nice break to otherwise hearty-rich fall meals. *Arbequina is a mild, grassy, Spanish olive oil. Sherry vinegar is a slightly more acidic substitute for Roasted Red Pepper Blackberry. Red currant jam can be found in most grocery stores and used in place of the Cranberry Port. In a large pot of salted boiling water, blanch onions for 30-45 seconds. Shock in an ice bath, drain and peel. Blanch broccoli florets in the same water until bright green and crisp tender, about 90 seconds. Chill in ice bath, drain and dry. Fry bacon in skillet over medium heat. When cooked through, remove bacon, leaving fat in the pan. Add Arbequina olive oil as needed to make 1/4 cup fat.. Add shallots and sauté until softened, 3-5 min. Add Cranberry Port Jam and whisk until it “melts” into the fat. Turn heat to medium-high, add sherry, cippolinis and cranberries. Cook 2 minutes while dressing reduces. Season broccoli florets with salt and a splash of Roasted Red Pepper Blackberry Vinegar. Top with cippolinis and dressing and sprinkle with dried cranberries. *Make it vegetarian. Leave out the bacon and start the dressing by sautéing the shallot in olive oil.